Without obvious reason, my face, jawline and neck area has become sensitive. The itchiness has caused me to scratch till wounded on my neck line. Not so nice looking in appearance so did not take a photo. The itchiness intensified each time I bathe or cleanse my face. I did not change my toiletries products nor did I eat extra ordinary food. Therefore, could not identify what's the cause of the problem. Besides itchiness, my skin around my face feel like sand paper. I have tried several products hoping to soothe the discomfort but all to my disappointment. One of my friends mentioned that I should use Vitamin E cream onto my daughter's forehead to heal the pimple marks which have been there for weeks...I quickly recalled that we have a pot of Vitamin E cream given by SIL months back. 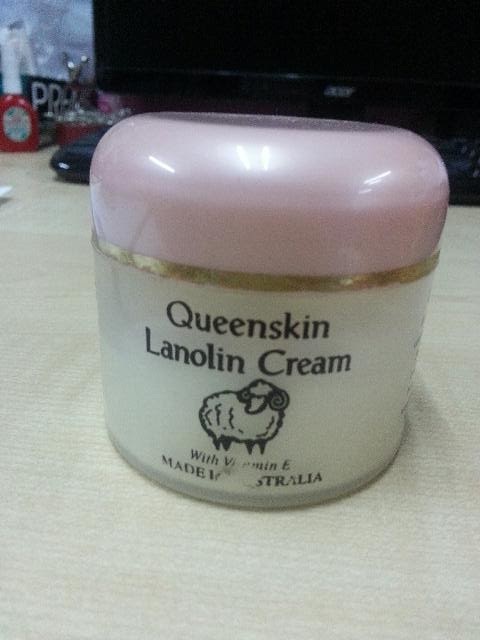 It is Queenskin Lanolin Cream, product of Australia. It moisturises my skin, I can feel the relieve of the itchiness after the first application. My face is obviously smoother now after less than a week. I let my daughter used it too. "Queenskin Lanolin Cream has the functions of revitalising and nourishing formula containing Vitamin E and Lanolin, it helps soften skin exposed to harsh weather conditions and daily routines. with the benefits of the natural oil from sheep's wool, it will leave skin supple, smooth and healthy. Can be applied as often as necessary." Thanks to my SIL for this great product. Sounds like a great product for you! Maybe hormonal changes that cause the irritation. I also feel like my skin change a bit after my 3rd pregnancy. More sensitive. Rose, you could be right..aging is another factor. Do you know where to buy this product?